What is 0 hunters? | "Fruit"
0 Hunters is built on the belief that role playing should be as easy and fun as any other form of entertainment. 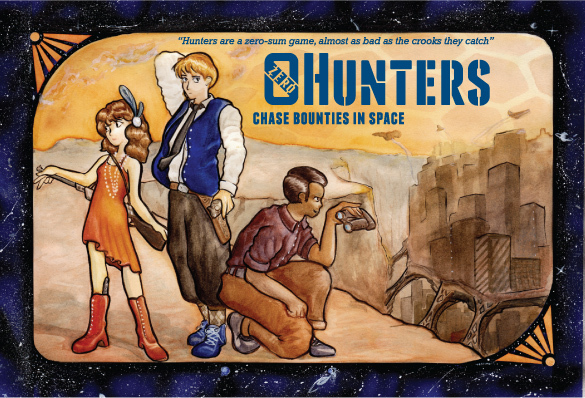 0 Hunters is designed to play well with new groups, and help old groups play more often. It does not compromise on what makes rpgs great, it addresses what keeps us from playing. You do not need to spend hours prepping a story, the game is always ready to play because plots help inspire a new story each time they are played. Plots also give you a clear guide to make your own content! Create characters and scenarios in seconds with the fantastic component presentation. Cards with art and fiction are a fantastic way to help inspire players at the table. Not to mention how much paper work a few tokens can save. The hunter’s start with a broken ship, atmo bound on the hot rock known as hearth, explore the harsh commercial, criminal and political landscape as the hunters take jobs from the planet’s entrenched establishments. Fix your ship and see the galaxy with expansion content or by creating your own worlds. check back in a month for public beta test information! Why have stats in an rpg? unless otherwise noted, everything here is Copyright 2009-2010 Tyler Tinsley.